Sassafras' medicinal value was first introduced to the Europeans in the mid-1950's. Around this time, a naive group of French Huguenots attempted to colonize a very small section, of what is now, northeastern Florida. These Frenchmen failed miserably. They failed because they did not grow any food! They relied on the indigenous people for almost everything. Needless to say, these Frenchmen got to know the habits of their native saviors very well. And, there were two such habits that the French colonists thought were worthy of note. One was the smoking of tobacco and the other was the consumption of sassafras. Indian tobacco was smoked for various reasons, but the main reason the starving Frenchmen took to it was that it has the ability to ward off hunger. And as for sassafras, the first Floridians had multiple uses for the tree. The wood was used for bows and in hand drill friction fires. 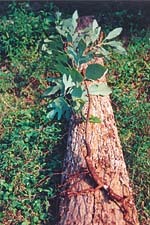 The leaves were utilized as a food and a spice, but it was the sassafras roots that got the attention of the Frenchmen. 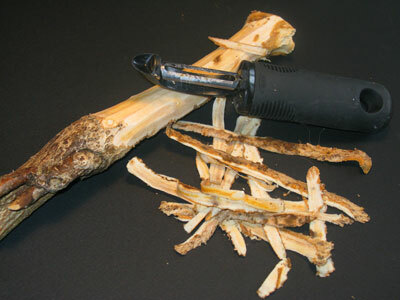 The root bark was boiled into a brew that prevented illness. The French Huguenots stated that whoever drank of it never got sick. But, what is most impressive is that it was used to cure individuals whose sickness was caused by drinking polluted water. This is extremely important in any survival setting where pure drinking water is absent. Even water that is too alkaline can cause gastrointestinal problems, including diarrhea. Chronic diarrhea, resulting in dehydration, caused by bad drinking water was and is the most efficient killer in the world. The Frenchmen passed the native peoples medicinal knowledge of sassafras on to the more successful "colonizing" Spanish, who spread the "word" to the rest of the world. Sassafras then, enjoyed a long period as the "wonder tonic," but today the herb has fallen into disuse. Mainly because, in the twentieth century most herbs have been negatively labeled by modern medicine. It is interesting that the institution that once downplayed the usefulness of herbs has shown how effective they can be through their own tests. Right before World War l, scientific research discovered that people who drank sassafras root tea were more resistant to severe sore throat infections and colds than those individuals who did not. Continued medical research was interrupted by the war, and later studies were curtailed by the development of modern antibiotics. But finally, research was resumed and it was found that sassafras has a general antiseptic power, and that it also induces the liver to cleanse toxins from the system. My personal use of sassafras has convinced me that this herb is the "real deal." I have tried various other herbs that are no doubt healthful, like Yellow Root, but none have kept me as healthy as sassafras. For the past four years, I have ritually consumed a gallon and a half of sassafras tea in the springtime, and then again at the very end of the summer. During this four-year period, I have not been sick. I do not even remember what a runny nose or sore throat feels like. And, no, I do not live on an island. My wife, child, co-workers, and others that I have daily contact with have all had the flu and colds. I can only hope that these near and dear people read this article and are finally encouraged to at least try this great tasting, body strengthening herb. Take two whole clean fresh roots from two, four to five foot, sassafras saplings. (Do not worry about destroying your sassafras stand by this root harvesting, because for every one sapling you pull up, two will grow back in its place.) Bring these two roots to a boil in almost two gallons of water. Let the roots boil for only ten minutes. Then, cover the pot and let it stand for four hours. After the four hour "sit," the delicious, healthful beverage is ready to drink.